Our Online Course Scheduling theme has designed especially for creating and sells courses. You can sell both online courses either onsite course. Course Schedule Script, this is at the heart of event-based businesses around the world. It is a platform for attracting new customers, managing existing ones and taking bookings online 24 hours. Open Source Learning Management System provides wide range of courses, classes and event-based businesses based all around the world. About payment, learner can choose to pay by Paypal, Stripe, PayMill or Authorized.net directly or they can choose to transfer by other methods(Admin can provide other methods such as bank transfer) then learners will have a submission from in backend to submit payment evidence (Bank transfer receipt for example). After learners submit, admin can check the evidence in admin’s backend and approve or reject the submission later. 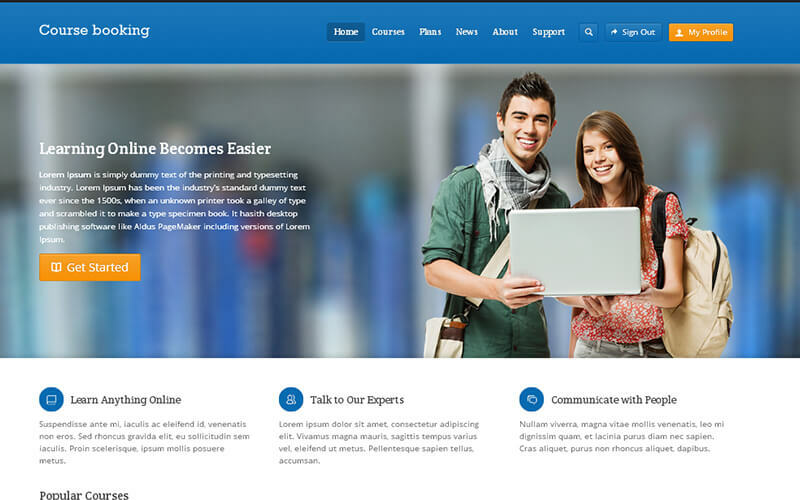 Online Course Booking Script is a perfect WordPress theme for sharing and selling your knowledge online. Online Course Booking Software is not just a theme, but learning management system that makes learning and teaching online easier for everyone. WordPress Online Course Booking Theme provides awesome features for creating online courses, such as extended user profiles, rating system, questions system, file attachments, embedding self-hosted media, tracking course progress, WooCommerce integration and more. Start teaching online with Academy! Modern features and customization options make this script an incredible one. I enjoy having this script purchased from this company. They have a very good technical team and they made everything easy for me. So I wish everyone to post their own reviews for this script soon. This script was really helped for my business. It’s having lot of features and customization option is too good so I could convert my course offers easily so I could gained more money. We would like to thank you all for the technical and design help. It has been a pleasure to talk to such friendly and understanding people, especially with your lack of website knowledge! To sum up we find PHP Scripts Mall very professional, excellent value for money and they have a superb customer relationship.